American River has become the second largest 50 miler in the United States. The race attracts both veterans and novices alike. Whether you are attempting American River has become the second largest 50 miler in the United States. The race attracts both veterans and novices alike. Whether you are attempting your first 50 miler or seeking a personal record, this race is for you! We are excited to partner with the City of Folsom as host to our new start line. We have also added a 25 miler event, starting in Beals Point. Two races, one scenic area! 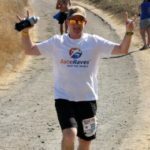 Music, motivational quote signs, superb aid stations and encouraging volunteers will inspire you all the way to Auburn. At the finish line, you will be awarded your one of a kind Patagonia finisher’s jacket and classic AR50 medallion. After the finish, enjoy our post race festivities and barbeque at Joe’s Café. The race begins at the Folsom Lake Marina at Brown’s Ravine. Runners will traverse the park road for 1 mile before hitting the majestic Brown’s Raving single track trails. Runners will make their way to Folsom Point, then along the Folsom Dam, across the Walker Bridge to the south side Lake Natoma before rejoining (our existing course) at the Nimbus Bluffs. Upon descending from the Nimbus Bluffs, the course will re-connect with the bike trail and intermix with fire roads and single track trails through mile 22. From mile 22 to mile 27, the course re-joins the pavement. After reaching Beal’s Point, runners will enjoy single track trails for the duration of the run to Auburn. At mile 46, runners will climb the infamous “Dam Wall.” Runners will be greeted at the summit by the Last Gasp aid station. With 3 miles to go, motivational mile mark signs, will boost your spirits as you tackle the last climb. The “Party at Mile 49” with cheering enthusiasts, an inflatable frog and ice cold cokes will send you off on your victory mile to Auburn. The AR25 course will start at Beale’s Point and will follow the AR50 course up to Auburn Overlook!! This event will start at 7AM, and there will be an option to take a bus in the morning from the Overlook down to Beale’s (however, there will not be a bus from the Overlook to Beale’s). You will have the same time frame to finish the 25 miles, as AR50 does (must finish by 8PM). I had an injury going into this race and unfortunately, I had to drop out at the Rattlesnake Bar aid station. I completed about 14 of the 25 miles. Up to that aid station the course was challenging, but scenic. The volunteers at the AS were great and the stations was well stocked with food and drink. Luckily, one of the volunteers drove me back to the finish after having only waited at the AS for about 15 minutes. At the finish, I was able to enjoy the BBQ while waiting for my friends to finish the 25 and 50 milers. I definitely would like to redeem myself and try again next year. This is a really great race. I highly recommend it for anyone looking to do their first 50 miler. This was my second year doing this race, and my best performance to date. I really wanted to come in sub 11, but am happy with my 11:14. This is a point to point race, starting at Brown’s Ravine, and finishing at the Auburn Dam Overlook. It has a very generous cut off time of 14:00. There are 10 aid stations during the course (not counting the finish line). There is a section between Granite Bay and Horseshoe Bar where you go nearly 9 miles between aid stations. It’s not an easy 9 miles, and has lots of single technical track. I can’t suggest this enough. Be sure you bring TWO bottles of water at a minimum during this stretch. I did this year, and it made all the difference in the world. I also suggest getting a crew. 🙂 I had an awesome crew, with Oscar and Oscar Jr coming out and supporting me. Had some love and support from Yoly as well, who was crewing my friend Jay. This made all the difference in the world, as they kept me fed/focused/cleaned up each time and made sure I didn’t spend too much time at each AS. Also, a crew helps you not have to worry or stress on how to get back to your car. 🙂 As I mentioned, this is a point to point race. The bus to the start leaves very early. Just before 4 am. I always stay at a local hotel the night before and the night after (Lake Natomas Inn). Overall, a very nice race brought you by the same folks that bring you Way Too Cool 50k. Will definitely be doing this one again. This race is very popular! This was my first 50 mile race and I had so much fun. There really isn’t that many hills. Mostly rolling, until the final 3 or so miles, then it’ll ALL uphill on a paved road. The course is really nice, and has some technical single track. Aid stations are super fun and very well stocked. The finish area is super fun too. I had an awesome crew of my wife and my oldest daughter and they made it so fun for me. I did accidentally head out on a very tough 9 mile stretch, through technical single track, with only one water bottle. This would prove to be a big mistake. It was around mile 29 or so. This is the longest stretch with no AS. I paid big time. Got a little dehydrated and was very anxious when I ran out of water. Got a little sick, then walked a lot, and ate and drank a ton at the next AS. 🙂 Took a little break, and got back on it. Luckily I felt great after that. TIP: TAKE TWO bottles through that stretch, next time. Can’t wait to do this race again. Good to know about the long stretch with no AS. I'm running the AR25 on 4/1/17, so I will be prepared with enough water. This was my first 50 miler and it was tough but I pushed through. I wore the wrong shoes for the first 20 and had blisters right away. My knee gave out as well (first time!) but pushed through the pain (not without prayer). Glad to share experience with my two girlfriends who completed the course within a minutes of each other. Luckily, I had an amazing crew and support which helped me so much especially with needing the shoe change at mile 20. The volunteer staff was very supportive and the cheering crowd at the end was great. Everything was very well organized and the aid stations were stocked well. I may try again for a better time next year. Race (formerly) began in Sacramento and ended in Auburn, all along the American River, half paved and half trail. (Course is different now.) This is a BIG 50M, with lots of aid and lots of participants. As a finisher, I received a fleece zip up jacket, mug and medal. The biggest issue is coordinating a ride back. If you are a slower runner, you didn’t have the option to use the shuttle.